Dubai – UAE: Smoothie King has made its foray into the Middle East, with the recent opening of its first outlet in the UAE in September. The outlet is located on the ground floor of BurJuman, one of the oldest shopping malls in the UAE, strategically situated in this vibrant neighborhood of Dubai. The outlet is the first of 45 branches expected to be launched over the next 5 years in the GCC by Al Ghurair Retail, part of Al Ghurair, for an area development agreement signed with the international smoothie brand. To mark this milestone, Smoothie King offered the first 50 responders a free smoothie. With a product offering that is fully customizable and includes a wide variety of nutritional smoothies, Smoothie King’s value proposition has been unmatched for nearly half a century. With our focus shifting to international markets growth, expansion in the Middle East is an important step forward in our ambitious growth plans of opening more than 1,000 new franchises worldwide by the end of 2017. The UAE is the perfect launch pad for a brand such as ours as we draw up plans with Al Ghurair Retail to expand Smoothie King’s presence in the country and launch across the GCC in the coming years”, said Smoothie King’s Owner and CEO, Wan Kim. Real estate professionals from Smoothie King worked closely with Al Ghurair Retail to choose the ideal location for the brand’s inaugural outlet in Dubai’s vibrant neighborhood of Bur Dubai. 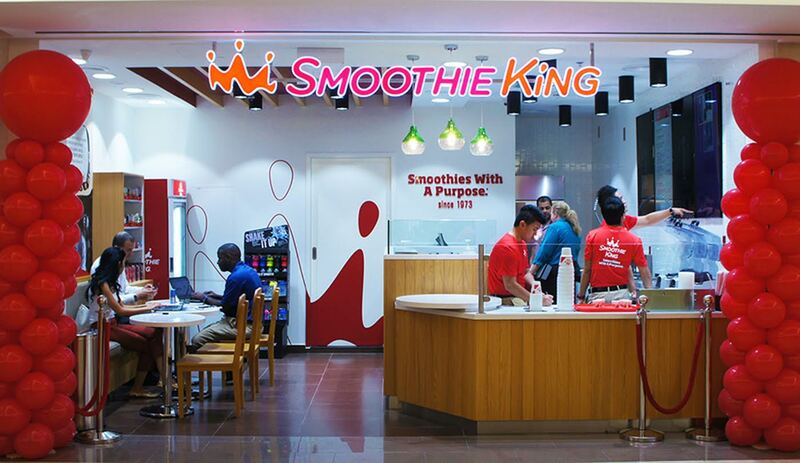 “With the fast paced life that people lead in the UAE, the demand for healthy F&B options on-the-go has increased tremendously and Smoothie King’s product offering is tailor-made to meet their needs. As the innovator and originator of the nutritional smoothie franchise, Smoothie King is the ideal partner for us as we mark our entry into the UAE and region’s F&B sector”, added Cabioch. With inspiring people to live a healthy and active lifestyle not only being the brand’s mission but largely the stimulus behind the evolution of the brand, Smoothie King can be a part of our guests program to achieve their individual health and fitness goals by choosing from the entirely customizable range of expertly blended, nutritious and delicious smoothies. “We offer ‘Smoothies With a Purpose.®’ and we constantly innovate and strive to deliver this brand promise. By bringing our products to new markets and communities across the world, we are playing a key role in helping people meet their fitness and nutritional goals”, added Kim. Smoothie King offers a wide variety of smoothies made with the highest quality ingredients, created to meet all nutritional goals including weight loss, weight gain and increased energy. Customers can customize their selection by choosing from a selection of enhancers for weight management, energy, fitness and wellness, as well as supplements. Dubai-based Al Ghurair Retail has been bringing world-renowned brands to the Arabian Gulf since 1999. From its Dubai HQ, the company is constantly seeking out new brand associations and high performance franchise concepts to enhance its rapidly-expanding portfolio. With six international flagship brands including Springfield, Morgan De Toi, and THEFACESHOP, Al Ghurair Retail is in the midst of an expansion program which will see its regional footprint increase by more than half in 2015, with the current 60-plus stores in the UAE, Qatar and Kuwait increasing to almost 100. Al Ghurair Retail is part of Al Ghurair, one of the largest diversified industrial enterprises in the Middle East, with global reach and business roots stretching back half a century. Its core focus is on Foods, Construction, Resources and Properties, with additional sector participation in Energy, Printing, Retail and Education further emphasizing its level of diversity within the B2B and B2C sectors. Based in its native Dubai, Al Ghurair directs operations spanning 20 countries on four continents – meeting vital human needs from nutrition to housing; energy to education. Its Food operations include flour mills in Dubai, Lebanon, Sudan, Algeria and Sri Lanka; and the group opened the first mall in the Middle East, Al Ghurair Centre, in 1982. Smoothie King Franchises, Inc. is a privately held, New Orleans, Louisiana USA based franchise company with 800 units worldwide. By creating each smoothie with a purpose, Smoothie King makes it simple and pleasurable for guests to achieve their individual health goals as part of a low-calorie diet and regular exercise routine. Smoothie King was founded in 1973 by Steve Kuhnau, whose mission was to help others achieve better health in a tasty way. In 1989, Smoothie King became the first franchised smoothie bar/health food store in the U.S. and currently operates in 33 states, the Caymans, the Republic of Korea and now Dubai. In 2015, Smoothie King was ranked No. 1 in the United States by Entrepreneur magazine in the juice bar category for the 23rd year and No. 92 overall on the 2015 Franchise 500 list. In 2014, Smoothie King partnered with the New Orleans Pelicans National Basketball Association professional team to launch the Smoothie King Center, a multi-purpose indoor arena in New Orleans, Louisiana.